Church funerals are more usually held at St Mary's which seats up to 100 people and for those recently living within the parish, lends itself naturally to a burial in the churchyard. 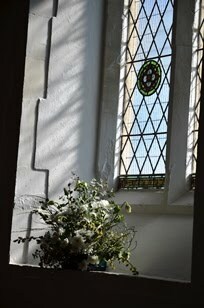 St Mary's is a beautiful church which offers an intimate setting for a small gathering. Alternatively, Emmanuel can seat 200 people. The churchyard at St Mary's is open. Anyone who lived in the parish or is on the electoral role or has an existing family grave can ask to be buried here. The Rector and Church Office will advise about the Diocesan Regulations which govern a churchyard, however, all such decisions are usually made by the Rector in accordance with the local situation at Hawkwell and the Diocesan Churchyard Regulations. What is/is not allowed in a C of E churchyard is distinctive, and different from Borough Cemeteries (see below). The names of people who are buried or interred in the churchyard or the Ashes Plot can be recorded in our Memorial Book. On most Tues, Wed and Thurs the church is open during office hours, 10am -12pm when anyone is welcome to come into the church to sit quietly, light a candle or pray. There are people available to talk or pray. Stepping Stones On the first Monday of each month (except Bank Holidays when it is the second Monday) 1.30-3.30pm at St Mary's we offer free informal support and advice to anyone needing help following a bereavement.